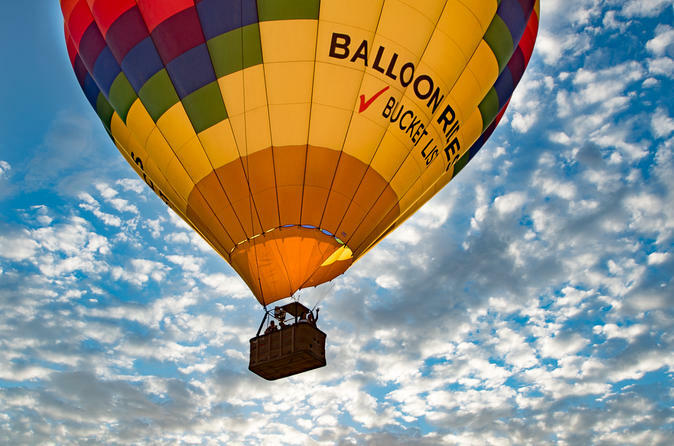 Float over the Rio Grande Valley during a sunrise hot-air balloon flight from Albuquerque, home of the largest hot-air balloon festival in the world. As the sun comes up over the Sandia Mountains, admire the dramatic reds and oranges that fill the sky, and learn about the features of the New Mexico landscape from your expert pilot. Back on the ground, celebrate a memorable flight with sparkling wine and a light breakfast for a perfect start to your day. Rise early to begin your hot-air balloon experience (optional pickup from your Albuquerque hotel is paid directly to the tour operator). Stop into the downtown headquarters for check-in, then ride to the balloon launch site. Your pilot begins the process of inflating the balloon when you arrive. Watch the fascinating transformation of the balloon as it fills up. You can even help out the crew during the inflation process for a more hands-on experience. After a safety briefing, step into the balloon’s basket and take to the skies with your professional pilot. As you float high above the ground, enjoy incredible birds-eye views of Albuquerque and the Rio Grande Valley. Capture great photos of the Rio Grande River and the Sandia Mountains, the 17-mile (26-km) mountain range located to the east of Albuquerque. Your pilot determines the route for the day depending on the wind’s direction. You may fly over the city of Albuquerque and even dip low enough to wave at people or skim the Rio Grande River. Then soar back up into the air again to get panoramic views of the New Mexico landscape. Throughout your flight, your pilot shares informative commentary about the landscape beneath you. You can also hear first-hand accounts of the Albuquerque International Balloon Fiesta, the world's largest hot-air balloon festival that takes place every October with some 750 balloons participating. After approximately one hour in the air, your pilot lands the balloon and the ground crew comes to meet you. Celebrate your flight with a complimentary glass of sparkling wine and a light continental breakfast. Then receive a flight certificate to commemorate your hot-air balloon experience before returning to the original starting point (with optional hotel drop-off paid to the tour operator).